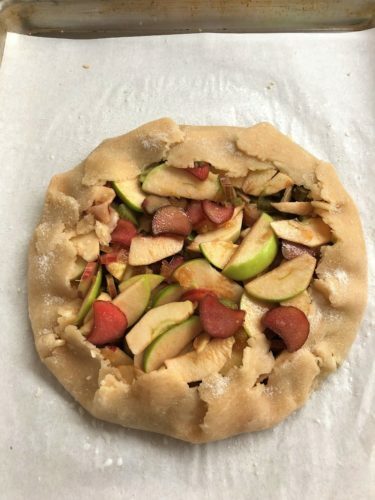 Send me a picture of your galette and I’ll add it to this post! Use your judgement for more or less sugar and cornstarch depending on the sweetness and juicyness of your fruit. Roll dough to about 11-inch circle. It's important to roll this dough between wax paper as my step-by-step photos show in the directions. You can try a well-floured surface if you don't have wax paper. Plastic wrap and parchment don't work so well. Bake on parchment lined baking sheet. 375F (convection) or 400F (conventional) 30 min or until bubbly and crust is golden. Ovens vary, time and temp may need adjustment. Serve warm or cool with whipped cream or ice cream. Yum! I love galettes. I sprinkle rolled oats over the crust to help absorb some of the juice from peaches, nectarines etc. Great idea Rita, I’ve not done that but will try it! Looks delicious! Maybe I’ll try it with peaches after we pick them next week! It will be so good with your Arizona peaches! I’d like to pick peaches before the season is over. Galettes are the BEST! I need to go over to Reno to see what fresh summer fruit I can find! I’m curious what fruits Reno is getting this time of year. Let us know! Yay for galettes! 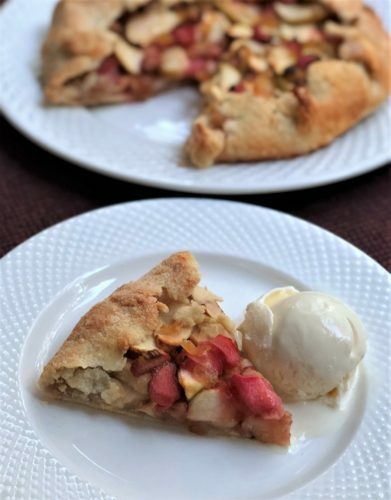 They’re such a simple, unfussy way to enjoy fruit and pastry, and if they turn out funny-looking it’s okay–rustic is how it’s supposed to be. I love Rita’s idea about oats. 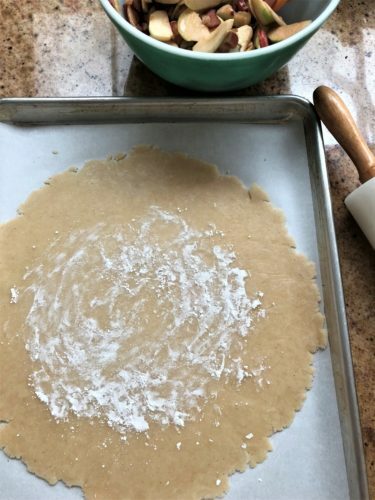 One of my favorite things to do is brush the rim of the crust with egg white and then sprinkle it with coarse or decorator’s sugar-it looks pretty, and adds a nice crunch to the pastry. Not sure if you were asking for a picture of my version of your galette, or just a photo of any galette I made, but here’s my photo and recipe for individual Peach Galettes: https://jillhough.com/recipes/peach-galettes/.